So you should know me well enough by now to know that around this time of the week I don't write my own posts. Blame it on the Gin. Blame it on trying to get everything ready for the Kitchen and Bath show next week (did I tell you all that I'm speaking on Wednesday?! Be there people!). Actually, blame it on all of my relatives this time for getting me sick and giving me a crappy cold that makes me all itchy and tingly. Naturally, when stuff like that gets in the way, I turn to my awesome fan base and ask for help. Ok... more like plead and whine until someone writes me a post. This week is no different. This week, the great peeps over at Arcadian Lighting offered to pitch in and give you a little design inspiration! Hello! I'm Jessica, a writer for Arcadian Lighting, a wonderful online resource for affordable light fixtures. Every day I get to search for beautiful interior design inspirations and then share them on lovely blogs, like D. Coop. Today, I'm delighted to share a collection of chic kitchens inspired by the sophisticated ambiance of cafes. The high-back love seat in this corner breakfast nook would look right at home at a cozy cafe. The rustic table and chairs with such eclectic pendant lights creates a cool, funky atmosphere. A sunny window seat with built-in benches creates the perfect spot for enjoying a cup of coffee and reading. Plenty of shelves and hidden drawers provide great storage. I love the simplicity of this breakfast table and it's banquette style seating. Simple folding chairs and an unique pendant light complete the scene. The set of brightly colored French cafe chairs adds a certain stylish je ne sais quoi to this lovely kitchen. Plenty of natural light suits the cream and bright blue color palette. 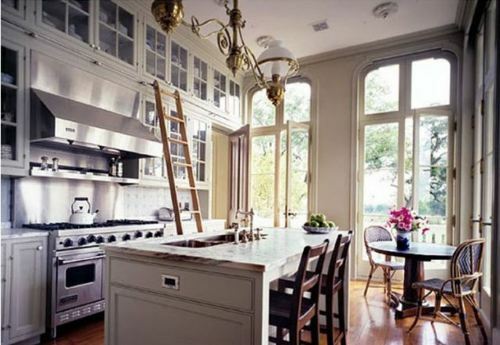 This sophisticated kitchen is modeled after classic French cafe's and restaurants. The ornate brass kitchen island light and corner table are such lovely accents in an already impressive room. This dining room features a lengthy mirror, candle wall sconces and traditional chandelier lighting to create a breezy French cafe atmosphere. I love the dusty blue accent colors. A charming robin's egg blue and dark wood furniture are such a beautiful combination. The open shelving along the kitchen island provide the perfect place for displaying crisp white china. There's nothing quite so quintessentially French than stripes. The checkered floor and gilded cafe chairs† are especially chic.